eOneNet.com presented the workshop "How To Sell Online and Make Your First Million" at Eastin Hotel recently. A crowd of businesswomen attended the talk to be enlightend by tips and ideas on how to make money online by international speaker for e-business events, Fione tan. Also present during the talk was image consultant Aziah Jasmine who gave the audience a brief overview on how to walk the walk and talk the talk. 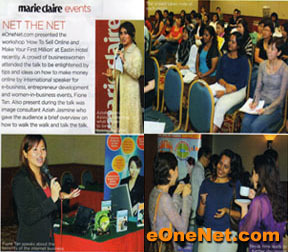 "Net The Net - Marie Claire – Internet Marketing Seminar"